World renowned humanitarian and the founder of The Art of Living Sri Sri Ravi Shankar today expressed his willingness to facilitate the process if any underground group wants to come back to the mainstream. He said this while addressing the media here in the presence of General Secretary of United Liberation Front of Asom (ULFA). “Several youth have already expressed their desire to come over ground if the government ensures a respectable deal. They are watching how the government handles the case of the 68 youth who recently surrendered in Manipur with our intervention,” he revealed. “The Art of Living will continue to work until the last gun is laid down,” Sri Sri Ravishankar added. He also added that The Art of Living is in touch with several groups in the region. He expressed happiness that diverse groups have come together on a common platform to discuss the issues facing the region. “There are differences of opinions and I see it as a healthy sign. Once the basic principle of peace is established, all differences can be sorted out,” he added. Saying that his heart goes out to the people of the region who had to undergo much suffering for decades, Sri Sri observed that while the aspiration of every group that has gone into militancy has been to achieve prosperity and welfare, it cannot be achieved with conflict and has to come with cooperation. It is only this understanding that can mark the beginning of a new chapter in the history of the region, he remarked. The conference saw the participation of leaders from all walks of life, including leaders who have formerly taken up arms. Several former underground leaders led by General Secretary of United Liberation Front of Assam (ULFA) Anup Chetia were among the conveners of the event. Other prominent names include former leader of armed Tripura National Volunteers Bijoy Kumar Hrangkhawl and Dilip Nunisa of Dima Halam Daogah, the Assam-based militant outfit that laid down arms in 2013. Anup Chetia, along with the other prominent leaders at the conference acknowledged and appreciated Gurudev’s interest and commitment to the region and resolved to continue to work together to bring peace and prosperity in the region. The conference saw the attendance of a large contingent of leaders from Nagaland, including former army chief of NSCN(IM) Lt Gen VS Atem and several other leaders from various social, ethnic, linguistic and religious groups. R S Mooshahary, former Governor of Meghalaya was present too and hailed Sri Sri as a peace ambassador. 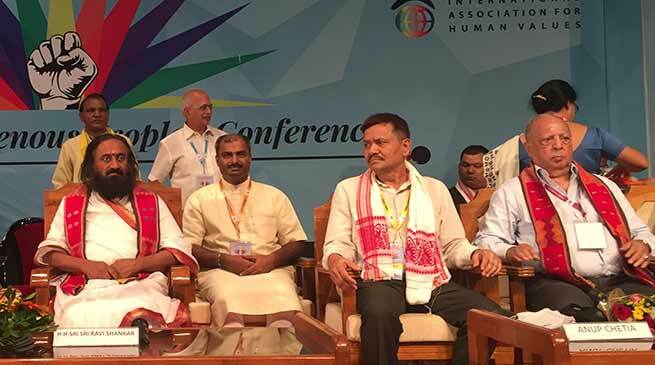 The day long deliberations at the Conference ended with the signing of the Guwahati Declaration by The Art of Living representatives and other conference partners, including the convener committee as well as all the linguistic, tribal, ethnic and insurgent groups of North East states. Everyone present pledged to bring together the indigenous peoples and ethnic groups of the region, and work collectively to achieve the ultimate goal of genuine peace, prosperity and happiness for North East. Seen here Anup Chetia reading out the historic Declaration.